Welcome to Szent Istvan University. In this letter, we would like to share with you some information about your stay and living in Hungary, as well as your studies. Please note that the academic year started on 3 September 2018. SPRING SEMESTER starts on 4 February 2019. The SPRING SEMESTER Orientation Week on Gödöllő Campus will start on 29 January 2019. Your classes will start on 4 February 2019. Students outside EU countries should turn to the relevant authorities (and their websites) at least 2 months before the beginning of their studies. They should hand in their application for a D5 student visa at the Hungarian Embassy in their home country. With a valid student visa they can apply for a residence permit also from the embassy or when they arrive in Budapest. The student visa may take up to 60 days to obtain. The regulations for the registration of the place of residence and the residence permit can also be found on the website of the Office of Immigration and Nationality (www.bmbah.hu) and/or of the Ministry of Foreign Affairs (http://konzuliszolgalat.kormany.hu/en). You will need the following items for your visa application if you need visa. Address: Gödöllő, 2100, Páter Károly u. 1. If you are a Stipendium Hungaricum or FAO scholar, you can be accommodated in the dormitory of Szent István University. The dorm offers double rooms for newcomers. Please send the „Hostel_application_form” (at the bottom of the homepage of the dormitory) directly to the dormitory international coordinator, Ms. Katalin Papp at papp.katalin@fh.szie.hu. The application form to the hostel includes some terms of payment. Please ignore those, just write 'Stipendium Hungaricum/FAO student' on the sheet, since your accommodation fee will be covered by the scholarship through the university. Please also note that due to the huge over-demand, the dorm maintains its rooms only for students, so if you arrive with your family, you have to find an accommodation other than the dormitory. We kindly ask for your understanding. If you are a self-fincancing student, for accommodation, please check the site at http://sziu.hu/accommodation. Please note that since the dormitory has limited places, newcoming scholarship holders have priority. Senior students’ accommodation in dormitory is subject to good behaviour and their academic performance. Address: 1118 Budapest, Szüret u. 2–18., Phone: (+36 1) 305 7100/7580). For their first year, rooms are automatically booked for Stipendium Hungaricum scholars and for two years for FAO scholars in Somogyi Imre Dormitory. For accommodation in Budapest, please check the site at http://sziu.hu/accommodation. In any case, please fill in this ARRIVAL FORM and note if you need help to find your way to your accommodation in Budapest and we'll try to arrange buddies or mentors to help you. Szent István University International Office provides free transport between Budapest and Gödöllő upon arrival to small groups of students (at least 2 people) with the taxi driver contracted by SZIU. For individual American, Kazakh, Korean, Japanese, Indian exchange students, Stipendium Hungaricum and FAO students it is free. Individual travellers have to pay the transfer fee individually, HUF 10,000 (+ waiting time) cash to the driver. If you know the date and time of your arrival, please fill in the Arrival Form with the required data. You will need a residence permit to stay in Hungary during your studies. For detailed information, please read carefully the webpage of the Hungarian Office of Immigration and Nationality and the page focusing on Residence Permit for the Purpose of Studies as well as http://sziu.hu/residence-permit. During the first weeks after your arrival, we will reserve some administration days at the Immigration Office so that you can arrange your residence permit as easily as possible. Stipendium Hungaricum and FAO scholars, please note that your insurance is expected to be valid only one month after your arrival, so please take care of the coverage of your first month’s insurance. Similarly, the first scholarships are expected to be paid in October, so please be sure to have enough money for the living costs of the first month. 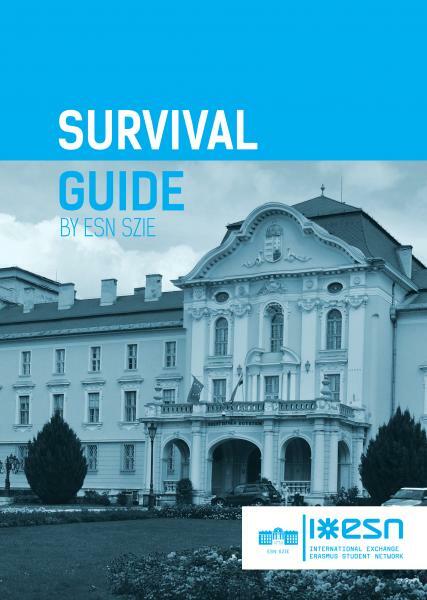 SURVIVAL GUIDE compiled by ESN SZIE. In the dormitory rooms (and most houses in Hungary) you will have clean running water (drinkable without boiling), electricity, central heating, and internet. You can have a variety of foods and drinks, in grocery stores, market places as well as in restaurants. Vegetarian food is available also in the two restaurants/canteens of the Gödöllő Campus. Halal food is available in Budapest. Some well-known restaurants that serve Halal food in Budapest include Szeraj, Al-Amir, Cairo Café, and Antalya Kebab. There are a few Halal meat shops in Budapest. More information regarding the best Halal restaurants in Budapest can be found at one of the mosques or Islamic Centers in the city, such as the Budapest Mosque which is located at H-1119 Budapest, Fehérvári út 41. Those who come from tropical countries should note that there are colder seasons in Hungary including a winter, so be prepared to bring or buy warmer clothes. Having a laptop for researching and writing is strongly recommended, although the university campus has computer facilities. We have a mentoring system operated by the Erasmus Student Network (ESN- at http://szie.esn.hu/). Mentors will be at your disposal in any kind of matters. However, You should also feel free to seek contact with senior students already here, they can help you a lot. In addition, our Hungarian students will be also eager to help you. For details of your programme and faculty, visit the various faculties’ homepages. We hope you will have a pleasant time at SZIU, and we are looking forward to meeting you soon!